Psychic advisors rely on a number of tools to enhance their readings, and herbs can offer invaluable insight. Learn how psychic advisors use herbs in a reading and discover what these natural substances can reveal. How Do Herbs Enhance Psychic Perceptions? For many psychic advisors, herbs can strengthen spiritual perceptions and open the door to a heightened level of awareness. When psychic advisors are more in tune with the spiritual energy that pulsates around them, they can grasp onto fragments that when combined form complete sensations and ideas. Many psychic advisors also find that herbs stimulate the senses and help them achieve greater mental clarity. Herbs can effectively remove ever-present distractions and demands, turn down environmental noise, and allow more subtle signals to make themselves known. Inhaling or consuming herbs can also offer a gentle reminder to enter a mindset that’s open to psychic perceptions. How Do Psychic Advisors Use Herbs? There are many ways for authentic psychic to use herbs. Most opt to consume herbs through scent or taste. Though psychic advisors can simply breathe in the subtle scents of fresh herbs, many choose to experience their fragrances in other ways. For instance, adding several fresh herbs to a satchel enables psychic advisors to concentrate plant-based fragrance for greater effect. Many advisors keep these aromatic satchels close at hand, either in a ceramic bowl or in a dream pillow, so that they can inhale the fragrance while asleep or awake. Applying essential oils to the body also enables some psychic advisors to keep herbal fragrances close while pursuing deeper spiritual connections. Incense cones, smudge sticks, and oil lamps also allow psychic advisors to breathe in these herbal aromas. While some advisors burn these herbal items during a reading, others find that inhaling them prior to beginning a reading helps to open the pathways to communication. Inhaling herbal aromas during meditation sessions offers ideal opportunities for psychic advisors to strengthen their spiritual perceptions. Many psychic advisors also opt to consume herbs by drinking custom-made teas. 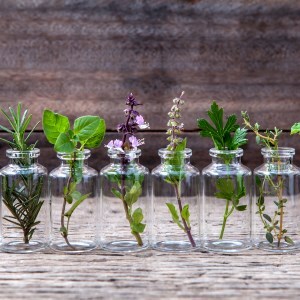 Steeping herbs in hot water stimulates both taste and scent sensations, offering even more channels to connect, perceive, and intuit psychic meaning. Which Herbs Are Most Powerful? Interested in learning more about herbs and psychic readings? Chat with a psychic online to gain insight into the information and possibilities that herbs can reveal.